At European Springs we pride ourselves on our dedication to quality and innovation, keeping our fingers on the proverbial pulse of engineering and its subsequent advances. Manufacturing everything from custom springsto wire forms, we are always intrigued when we hear of innovation in a similar field. The great thing about engineering is the industry&apos;s ability to continually improve standards of living, be it through subtle changes or grand improvements. With the increase in the availability of 3D printers, there are continuing stories of innovation hitting the news as more and more people realise their pseudo-casting potential. Through a process called 3D bioprinting, there is an increasing ability to be able to construct custom repairs for damaged parts of organs. For example, one could create bespoke sections for damaged windpipes by combining the 3D printing technology and tissue engineering to connect, or fuse, the sections of a windpipe. At the Feinstein Institute for Medical Research they have modified a 3D printer to incorporate a syringe of living cells that produce collagen and cartilage which, within a few hours, can bioengineer tracheas specific to an individual&apos;s precise biological requirements. The speed and cost at which these can be produced opens up a plethora of doors for the future of medicine and biological research. As with parts of organs, there is seemingly an exciting future ahead when it comes to full organs and the printing of internal structures. 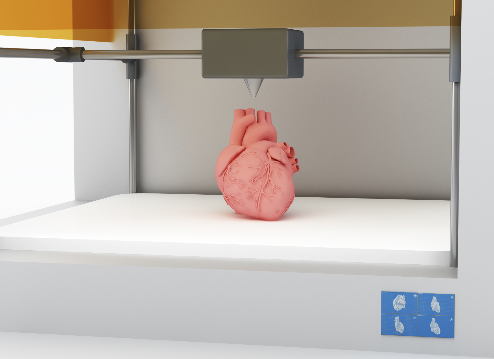 Medical company, Organovo, began selling 3D printed liver tissue in 2013, although it seems that it may be a while before fully functioning livers can be printed and made available. The research does however give hope for the creation of 3D prints of a range of body parts, such as blood vessels, eyes, bones or even skin and hearts, and with the ability to graft to a particular individual, just imagine the number of lives that this could save. Also, through CT scan data, doctors are able to print 3D versions of people&apos;s internal organs, meaning that they can have a literal hands on approach to discovering irregularities, such as fatal tumours. Such developments follow on seamlessly yet exponentially from the current 3D printer-created prosthetic limbs that have been developed to improve the lives of children worldwide. Living in the 21st century there are perpetually advances in technology that make Back to the Future look like something of a soothsayer – although we are still waiting on the hover-board to roll out. At European Springs, we love seeing other companies share our forward-thinking notions and passion towards design and implementation of new technologies and can&apos;t wait to see where these will take us next year, let alone the next decade. If you would like to discuss our springs and pressing services, then don&apos;t hesitate to contact uson 0208 663 1800 where one of our friendly specialists will be eagerly awaiting your call.